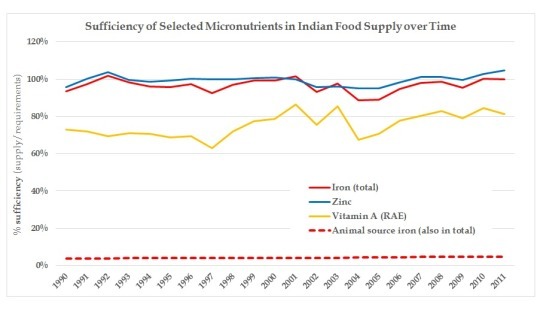 Starting upstream: Why are Indians not getting enough micronutrients? infant feeding practices in the United States. In my time at Cornell, where I got my PhD in Nutritional Sciences, I have learned so many things that I had no idea I had to learn, and many things that were completely different than I thought they were. This, combined with the many folks in my life who are not nutritional scientists, has drawn a conflict into focus: nutrition is incredibly complex, but people who realize its importance often want—and think there are—simple answers. This is one of the major battles in public health and, specifically, in nutrition. We all agree that we want people to eat enough food, and healthy food, but it’s not always clear what that means, or how to do it. Human bodies are complex, food is complex, and food systems are complex. The connections between food systems, foods, and bodies are even more complex, and involve economies, politics, infrastructure, and socio-cultural values. Whew! But what is not complex is this: India has a major malnutrition problem, particularly with getting enough micronutrients (i.e., vitamins and minerals) into the bodies of its residents, and that needs to be addressed, and quickly. Micronutrients like iron, zinc, and vitamin A are really important for lots of things, and some people are hit particularly hard by not having enough of them. I think of these vulnerable groups as people that are in the midst of building bodies—either their own (i.e., infants and children) or someone else’s (i.e., pregnant and breastfeeding women). Think of a construction crew starting a new building, but with a pile of bricks that are too few, too small, or too crumbly. That might give you an idea of what happens in a young body that is trying to lay down a foundation on which to build the rest of their lives. One of the things that makes it difficult to improve nutrition is that there is a long way that nutrients must travel between when they are grown to when they are used by a body. When people don’t get enough nutrients, it could be because of things that happen during production, distribution, acquisition, preparation, consumption, or absorption! So where do we start? For this project, I started at the top of the stream: production. I wanted to answer the general question: is there enough iron, zinc, and vitamin A for everyone in the food supply? This question is important to answer because we need to understand where our priorities should be. So, for example, if there isn’t enough zinc in the food supply, then we know that, unless the food supply is improved, other downstream actions to reduce zinc deficiency (like better food distribution or better dietary intake patterns) aren’t going to be enough. In general, answering this question meant comparing how much is needed by India’s population to how much is available to them. 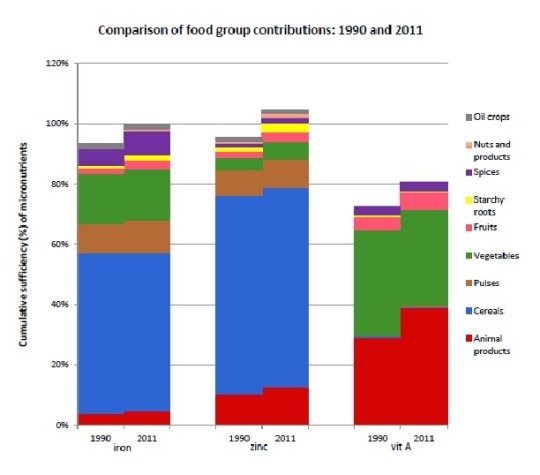 Because of the big changes to the Indian food system in recent history, we also looked at how the numbers changed from 1990-2011. 1. Include the foods listed in The Nutritive Value of Indian Foods, by Gopolan et al. This was the primary source of which foods to include because of its unique place as a source of foods that are native to India. This is something we haven’t had available to us before. 2. Include comparable foods listed in the Bangladesh Food Composition Tables, especially if there are more complete data for a particular food than its counterpart in the Indian data. This let us fill in some gaps in the Indian data, especially for food groups with really limited data, like seafoods. I primarily relied on data from the Bangladesh Food Composition Tables, which compile a number of sources from around the world and provide a detailed description of how they obtained their data. Where the Bangladesh data had gaps—either in foods, or nutrients within foods—I patched in data from India and the U.S. where they were clear and reliable. After I made a database of foods and nutrients, I was able to estimate the nutrient density of a range of foods and food groups. Putting this together with the amount of food produced in the Indian food system—which I took from India’s Food Balance Sheets, which account for things like waste and food that goes to livestock—I could estimate how much iron, zinc, and vitamin A was in the food supply in total. 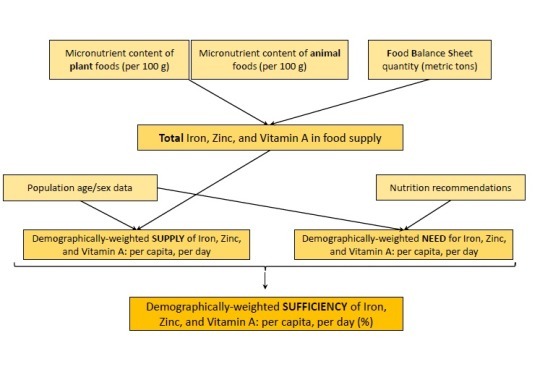 Then, using demographic data, I estimated how much of these micronutrients were available to each person, and compared that to how much each person needs, and came up with a number for the sufficiency of iron, zinc and vitamin A, per capita, per day in the Indian food supply. I also repeated the last part of this process for macronutrients (i.e., energy, protein, and fat), but I didn’t have to use nutrient databases for those—I could take the amount of these in the food supply directly from Food Balance Sheets. Despite the fact that the limitations of the method described above introduce an unknown amount of error in the data, there were still some important findings that rose to the surface here: there almost certainly isn’t enough fat or vitamin A in the food supply to meet everyone’s needs, and it seems unlikely that there is enough iron or zinc. In fact, the limitations of the method described above might mean that these are overestimates of iron, zinc, and vitamin A content. These findings aren’t surprising, but shed some light on what we already know as well as where we—as in, TCi and others that work on malnutrition in India—can go from here. 2. Change the nutrient content of what is produced (e.g., biofortification). Moving further downstream, there are a number of research questions that we can explore here at TCi. The work I’ve done here gives a starting point of what nutrients there are in the food supply, but that doesn’t give a picture of how and where they are distributed, how that distribution and transportation might affect the nutrient content of foods, who does and doesn’t purchase nutrient-dense foods, how storage and preparation might affect nutrient content, and who eats what within households. Following this stream is an important potential way of figuring out why micronutrient deficiencies happen and, consequently, how we can “plug the leaks”—i.e., make sure the nutrition that’s out there gets into the mouths of those who need it most.